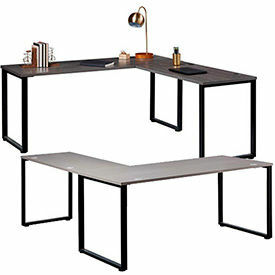 Interion® Collaboration Tables incorporate a clean and modular design which can be configured for any office space. The open concept minimizes interruption of the surroundings, and creates a sleek and modern work environment. Perfect for Agile war rooms, pair programming environment, or any other collaborative work environment. The work surface is a durable white laminate finish supported by heavy duty steel tube legs in satin black. Each leg has level-adjustable non-marring feet for stability. Available in single or double workstation configurations. Optional translucent, magnetic whiteboard or fabric partitions and 2 or 3-drawer under-desk file cabinets also available. Easy to clean and assemble. Interion® Open Plan Desking System Allows Custom Office Configurations. Interion® Open Plan Desking System has a modular design for new or changing work space needs. 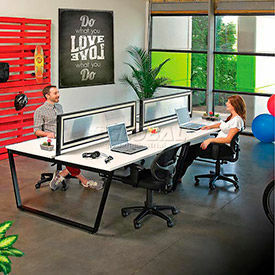 This collection is suited for individual and collaborative work areas, and can be expanded as needed. Available pieces include Office Desk, Pedestal, Pedestal w/Cushion, Return Desk, Standing Height Desk, and Standing Height Return Desk. All Purpose Tables Feature Dependable, Multi-Purpose Work Surfaces With 400 Lb. Capacity. These activity tables feature 1-1/4" solid core self-edged top with textured wood grain laminate surface that is scratch and stain resistant. Backing sheet prevents warping. 1-1/4" square chrome plated tubular steel legs are fitted with adjustable height floor glides. Convenient 29"H. Easy Assembly. 30 Year Limited Warranty. Click here to see our full selection of Stackable Chairs. OFM - Endure Series Standing Height Tables w/ Attached Seats are made of metal and laminate to provide long lasting durability. 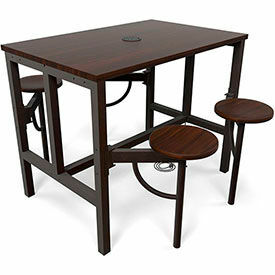 Standing-height collaborative table features swivel seats for guests or visitors. Swivel under table for easy storage. Tables have flip electrical panel for workstations. Available styles include Standing Height Table w/Attached Seats and Standing Height Table w/Dry Erase Tabletop and Attached Seats. Tables are available with 4, 8, 12 or 16 seats. Tabletop colors are Walnut or White. Seat colors are Gray or Walnut. Panels available with 3 AC outlets or 2 USB ports. Other dimensions vary per model. 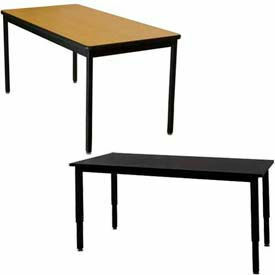 Attractive, Functional Utility Tables Are Perfect For Any Library, School, Office Or Work Environment. All purpose utility tables are designed and built for commercial use. Mar-proof high pressure laminate surface features bull nose edges. Heavy duty 14 gauge steel framing and legs offer superior strength. Legs include built-in adjustable leg glides for uneven surfaces. 30 H table top. Available in choice of Maple or Cherry top finish. Easy assembly. All-Purpose Tables Feature A 30 Year Limited Warranty! 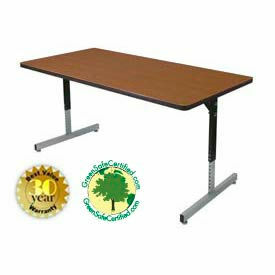 Height adjustable tables permit flexible use from computer workstations and conferences to security stations and lunchrooms. These activity tables feature a 1-1/4" thick scratch and moisture resistant high pressure plastic laminate top. 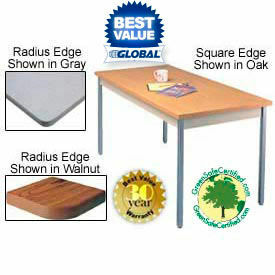 Table tops have protective black vinyl T-mold edging for safety. 16 gauge steel frame has full width stretcher bar for stability and helps prevent table warping. Chrome plated steel legs are height adjustable at 1" increments from 22-3/4 to 30-3/4"H and lock into place for reliable safety. Steel frame has black enamel finish. 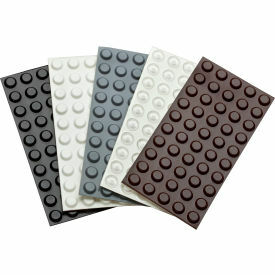 Self leveling floor glides feature rubber cushions to protect surfaces. 30 Year Limited Warranty. 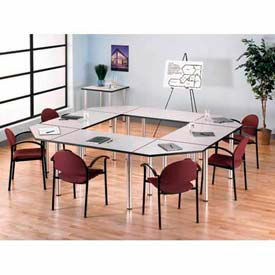 Aspen Tables Are Highly Configurable, Used for Multi-Purpose and Training Rooms. Aspen tables come in 4 different shapes Large Rectangle, Small Rectangle, Square and Trapezoid By using the Corner Connector tables can be joined into an endless variety of shapes. 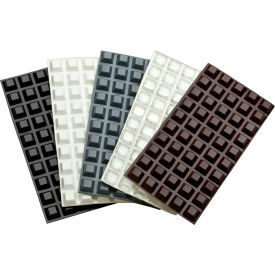 Available in Hansen Cherry and White Spectrum finishes. 10 Year Limited Warranty. Square Laminate Game Table Provides A Convenient Multi-Purpose Activity Table For Playrooms, Rest Areas, Activity Centers And Other Recreational Environments. Table top is made using a 1-1/8" thick high pressure laminate top with a maple finished background. Table top features a game board pattern to conveniently play board games without the use of any boards. 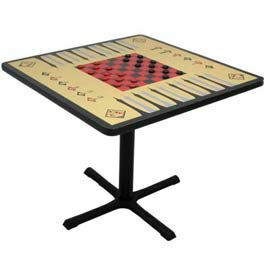 Great for playing chess, checkers, backgammon and card games. Stable 4-leg pedestal base. Table measures 36" x 36". 30 Year Limited Warranty. Wisconsin Bench Mfg. 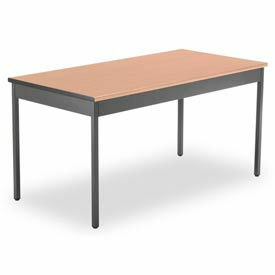 - LOBO Heavy Duty Utility Tables - Fixed or Adjustable Legs Are Used For Classrooms, Laboratories, Work Areas And More. Heavy Duty Utility Tables are made of 1-1/8 in. medium density fiberboard core, with a high pressure laminate surface and phenolic backer for long lasting durability. 1 in x 2 in 16-gauge steel apron frame and 14-gauge adjustable legs have a black powdercoat finish to provide extra stability. Metal apron is attached prior to shipping. Top coat colors are available in Bannister Oak, Clear Lacquer, Black, Fusion Maple, Gray Nebula, Montana Walnut and Wild Cherry. Top construction is Hard Maple, Hardwood, Laminate with MDF Core or Phenolic. Dimensions vary per model.